California is home to more federal disability lawsuits than the next four states combined. Depending on who’s telling the story—the enforcement of the Americans with Disabilities Act in California is either working as intended to ensure equal access for the disabled, or it’s in desperate need of reform to reduce the number of lawsuits over technical violations of the law. One thing is clear: the number of federal ADA lawsuits filed in the Golden State far outpaces any other state in the nation. Small businesses are sometimes caught between the threat of lawsuits and the challenge of inscrutable building codes. The Investigative Unit reviewed more than 10,000 federal ADA lawsuits filed since 2005 in the five states with the highest disabled populations. More lawsuits have been filed in California than Florida, Pennsylvania, Texas and New York combined. Many complaints told a story of embarrassment and inequality. One suit alleged an amputee had to use the restroom with the door open because the stall wasn’t big enough for her wheelchair. Other suits claimed ADA violations that were less obvious. Certified access specialist Christina Stevens drove with reporter Vicky Nguyen around San Jose to point out ADA violations at businesses both big and small. Ky relies on a wheelchair to get around the shop daily. She said she had never received a complaint from any disabled patrons until she was hit with a lawsuit from San Jose based “Moore Law Firm” for discriminating against the disabled. Ky was sued for violations including having an outdated sign for the unisex bathroom that was the wrong shape, and not having an emblem engraved in a table indicating it was wheelchair accessible, despite having multiple tables in her facility that were accessible. Disability rights attorneys take umbrage at what they call a campaign to besmirch disabled plaintiffs. Businesses can hire a certified access specialist to make sure their properties are complying with the latest regulations. Of the 7,188 federal ADA suits in California reviewed by NBC Bay Area 4,215 were filed by a plaintiff who’s filed at least 30 lawsuits. Business owners call these plaintiffs “serial filers,” while Moore maintains they are advocates on the front line of a civil rights battle. “In every civil rights fight that there is, you have to realize that it’s only a few people that take the step to go forward and fight for the rights of everyone,” Moore said. Many businesses have trouble staying accessible with or without litigation. “Given the way the building codes change as often as they do, it’s virtually impossible [to be in full compliance]” certified access specialist Christina Stevens said. In a short drive around San Jose, Stevens pointed out violations at businesses both big and small. “In this iteration of the building code, they actually legislated the color blue,” she said. “Now there’s a specific color blue [disabled parking spaces] have to be and somebody could sue because it’s the wrong color blue,” Stevens explained. 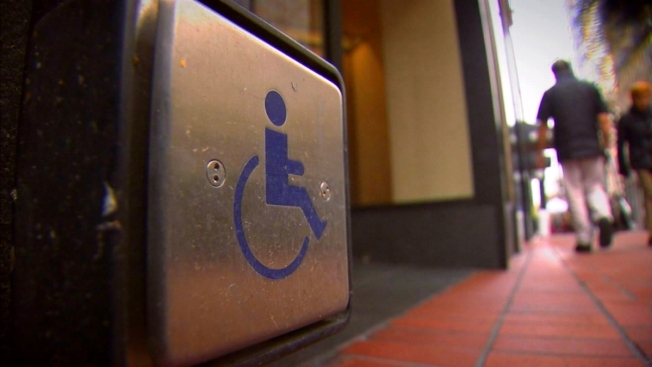 Businesses must be meticulous when it comes to addressing every potential ADA violation. For example, a light gray sidewalk could have dark gray truncated domes. “They have now legislated back this needs to be yellow,” Stevens said. Violating the ADA in California carries a minimum $4,000 penalty in addition to the plaintiff’s legal fees. Unlike most laws, enforcement of the ADA is not up to police or inspectors; it’s up to private lawsuits by private citizens. “The advice we give small businesses is:, once a year pay a certified access specialist for an audit and find out if you’re fully compliant or not and if not make a plan to become fully compliant, Kim Stone, president of the Civil Justice Association of California said. Her organization has supported bills that would try to reduce the number of lawsuits with a 90 day “fix-it” period. So far, the attempts have failed. Click Here to find a Certified Access Specialist in your area.